I love rhyme. Poems with rhyming schemes will, for me, always win over those which have none. For this reason, Rudyard Kipling is one of my favourites poets. Born in Bombay, India in 1865, Kipling was a child of the Raj. His father was an academic and he spent most of his youth being brought up in England by a British family before going to boarding school and eventually returning to British India. He eventually became a writer, producing such famous novels as the Jungle Book and Kim. 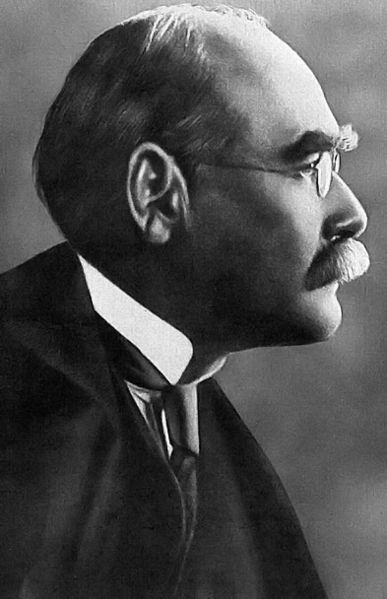 In the early 20th century, Kipling’s popularity as a writer reaches its zenith, with the author becoming the first Briton to be awarded the Nobel Prize for Literature in 1907. It was around this time that Kipling wrote what was to become his most famous poem: If-. In the final line, it is apparent that the poem is being addressed to the author’s son (who would later be killed in the First World War). Rather like Newbolt’s Vitai Lampada, If- is a memorable conjuration of Victorian stoicism, and the ‘stiff upper-lip’ which popular culture has now made into a traditional British characteristic. It offers the reader wise, commonsensical advice about how to take on and deal with life’s challenges. In my opinion, every teenager should be required to study it. If any poem were to be manly, this poem would be.